Prove that you are a genius of mathematics with this game whose protagonists are the characters of the Disney movie Big Hero 6. If you have seen this film you will know that its protagonists are geniuses of physics and for this they need to know very well how to calculate. Now you will have to test your math skills by solving these operations and saying if they are correct or incorrect. They will teach you already resolved mathematical operations, but you will have to say if the result is true or false. Choose the correct option and continue advancing in the game. You will start at the easy level but if you manage to overcome all the questions you will ascend to the middle, and thus until you complete this mathematical challenge completely. 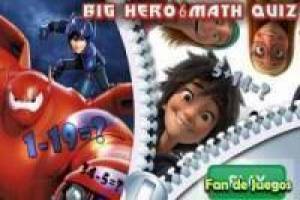 Enjoy the game Big hero 6 mathematics, it's free, it's one of our big hero 6 games we've selected.